Natural gas has been cast by some as an eco-friendly alternative to coal because of its lower carbon emissions, but natural gas power plants themselves aren’t all that efficient. 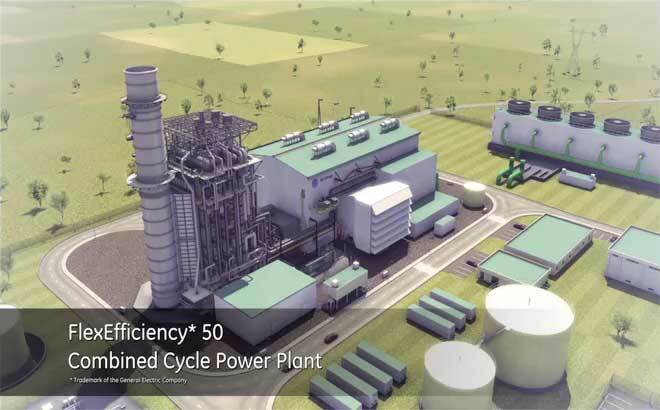 GE (s GE) on Wednesday announced a natural gas power plant design that is more efficient than the standard, and allows grid and power plant operators to better manage power supply and demand, and integrate natural gas power with clean power. The FlexEfficiency 50 design can convert 61 percent of the energy in every cubic foot of natural gas into electricity and ramp up power production at a rate of 50 MW per minute. The design is a departure from what power plants usually do today, delivering either high efficiencies or speedy power ramp-up rates, but not usually both, said Paul Browning, VP of thermal products at GE Energy. GE previously offered power plants that could achieve 60-percent efficiency, but those designs couldn’t offer the quick ramp-up rates that will become more critical with the growing amount of wind and solar electricity flowing to the grid, Browning said. At the same time, GE previously also offered power plants that can boost production quickly but can operate only at 46-percent efficiency. The low efficiency is because of the use of simple-cycle combustion turbines. Combined-cycle power plants are more cutting-edge and efficient because they reuse the waste heat from gas turbines to generate power. GE is borrowing from a jet engine design that allows the pilot to change the thrust level of the airplane quickly to boost the ramp-up rate for a combined cycle power plant, Browning said. Boosting electricity output quickly has always been crucial for responding to the fluctuating demand of the power grid, particularly when demand spikes because, say, people are cranking up their air conditioning during a particularly hot day. But power plants can’t run at full blast right after they are turned on. The need to be able to ramp-up quickly becomes even more critical with the addition of renewable energy such as wind and solar. The production of wind and solar electricity is dependent on when the wind blows or the sun shines, so neither can deliver a steady supply of power to the grid around the clock. Yet the grid must maintain a balance of supply and demand in order to run smoothly. Grid operators and utilities across the country have wrestled with the challenge of integrating wind and solar electricity into the power supply without disrupting the grid. “With 1 percent or 2 percent of renewables, it’s not an issue. But at 5 percent to eventually 33 percent or 40 percent, then it becomes an enormous challenge,” Browning said. California has a mandate to buy 33 percent of its electricity from renewable sources by 2020. GE is a formidable player in the power plant engineering business, from the fossil fuel varieties to wind power. The company is tackling the solar power business in earnest and last month, announced a plan to build a 400 MW factory to build solar panels using cadmium-telluride, the same type of solar panels made by First Solar (s FSLR). GE has made it clear it wants to not only make solar panels but also engineer solar power plants. @Carlo: When I said efficiencies in the 30s and 40s, I meant natural gas power plants. Those that are in operations today and not just the most technologically advanced ones. And, you said natural gas power plants emit “no pollution except some NOX gases,” so, yes, you did say they emit no carbon dioxide. Ucilia, carbon dioxide per se is no pollutant, which is why i separated the subjects. You and I emit carbon dioxide all the time by breathing, yet we re not polluting. The problem with CO2 is the disruption of its natural balance in the atmosphere via massive burning of carbon based sources normally locked away from the natural carbon cycle. But CO2 is a natural component of Earth’s atmosphere and actually necessary in order to keep suitable temperatures to life on Earth. I understand what you meant, Carlo. By your definition, any naturally occurring chemical is not a pollutant, so nitrogen oxides really aren’t pollutants because you can find them in nature. Or is something not a pollutant if it doesn’t affect our health by inhaling it? Or should the term “pollutant” refer to something produced by human activities that when there is too much of it, it seriously damages the environment? The definition one chooses depends on how much responsibility one wants to take for protecting the environment. Well, it’s a controversial subject, but in general I’d say that a pollutant directly affects health of living beings, whereas greenhouse gases, like CO2 or methane, directly affect climate, to which life has adapted over billions of years. Life can adapt to climate changes (although itâ€™s a greater struggle if they come as quicky as they are now), whereas with a pollutant we can only get sick. This is not to understate the importance of the CO2 issue, on the contrary, but it’s to explain why I say (and confirm) that gas plants are rather environmentally friendly and very little polluting. Indeed, when gas came out as a new option in the 80s, the main focus of the industry was to show the absence of nasty pollutants as metals or VOCs, which usually come from burning more complex organic molecules. To make a comparison, a natural gas plant is more environmentally friendly than a wood-burning biomass plant. The first one will release little pollution but considerable â€œfossilâ€ CO2, the second will have a net zero or near-zero CO2 emission (you release what was soaked up by the plant to grow), but many pollutants will be released, with direct risks to human health. That is why thereâ€™s quite a nimby approach in many communities to this kind of renewable source. Ideally then, a biogas power plant would be the perfect solution, with zero net CO2 emitted, and only some NOX released. Back to the point of your interesting article, combined cycle gas plants are the state-of-the-art of burning fossil fuels, which makes them the technology of choice in the transition to new energy sources. The progress made by GE to make them more responsive to fluctuant renewable production is the key point of this new design. In Italy for example, we have over 100 gas power plants in operation, and with 22% renewable electricity in the mix (with solar growing at stellar rates) this kind of progress is most welcome. Ehm… actually natural gas power plants are quite simply the most efficient type of thermoelectric power plants, full stop. Coal plants will typically deliver some 35% efficiency, while natural gas power plants are always above 50%. The target for modern gas plants is 58%, therefore this 61% improvement is probably more interesting for its dynamics, rather than for the efficiency figure itself. But always remember, natural gas plants are both a lot less polluting (actually, no pollution except some NOX gases due to air combustion), a lot less carbon intensive, and a lot more efficient than any coal plant in the world. Exactly, 30-40% is quite bad, that’s one of the many problems of coal power generation. A gas plant will always deliver over 50% efficiency (in Italy we run 60% of our electricity on gas, with 58% efficient combined-cycle gas plants) and it will often be coupled with district heating, in which case the overall efficiency will reach 80% (an added 20% being the exhaust heat put to use for industry and residential premises). As to carbon emissions, I didn’t say they don’t emit any, but that they are “a lot less carbon intensive”. To give some numbers, a gas plant will emit half (or less) the carbon that a coal plant would for each kWh of electricity produced. All this while having used less primary energy, due to its higher efficiency (therefore, less waste heat into the atmosphere). As for pollution, gas will give some NOX (due to nitrogen in the air) while coal will give many more problems, particularly in terms of metals (impurities in the coal). PS: sorry, I am taking for granted that when it comes to gas power plants, combined cycle is the technology of choice, and not the simple Brayton cycle, as used in airplane engines (which indeed will have less than 50% efficiency). All modern gas power plants are built as combined-cycle units, since it’s a no brainer in financial terms.